Although acne is a very common condition, especially among teenagers but also in adults, many people have misconceptions about what causes it, what it is, and the best ways to go about treating it. Fortunately for those living in Toronto, Toronto Acne Clinic are highly experienced acne doctors and Cosmetic Dermatology Specialist are ready to help you sort through the misinformation and develop a plan to get rid of the condition once and for all. Our Cosmetic Dermatology Specialist will be able to speak with you in greater detail about the condition during your visit. Here is an overview of acne. The skin’s oil glands give off greasy secretions. Those secretions plug the openings that exist for hair follicles. You may have heard of this condition referred to as “clogged pores”. When the clogged openings are large, the result is blackheads. The most common location for blackheads is the nose, but they sometimes show up on other areas of the face as well. When the openings that are clogged by the secretions are smaller, whiteheads result. Both may swell, and the result of this swelling is acne. One of the reasons that acne can be embarrassing is that many people think that it is caused by personal behaviour, often including poor hygiene or eating habits. While these factors may contribute to it, high hormone levels and other causes that have nothing at all to do with how a person cares for himself or herself are also common. Bacteria that live on the skin and medications are also frequent causes of it. Four in five cases of acne involve teenagers, though that leaves 20% of cases occurring in adults. This means that adults should not be overly concerned if the condition develops. While there are plenty of ways to deal with rare, minor acne outbreaks, those in Toronto who struggle with severe or persistent cases should set up an appointment with an Cosmetic Dermatology Specialist. 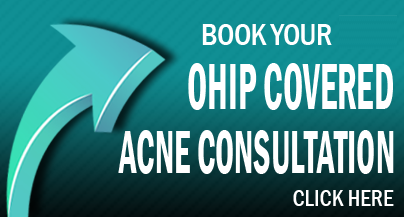 Toronto Acne Doctors would be more than happy to help you just as they helped so many others.